The Empty Bowls Project is an international movement to help end hunger. Guests are invited for a meal of soup and bread, and as a “thank you” for donating to local hunger relief, are gifted a handmade bowl as a reminder of all of the empty bowls in the world. Once again, Urban Eats Cafe is participating in support of St. Anthony’s Food Pantry. Empty Bowls 2017 kicks off with Sunday brunch service on December 3rd. Hundreds of hand-crafted bowls will be available for donors to choose from and fill with vegan sweet potato and black bean chili or white bean chicken chili. Come by Urban Eats again on Saturday, December 9th during the Dutchtown Shop Hop and again have a chance to donate, select your handmade bowl, and fill it with a variety of soups. 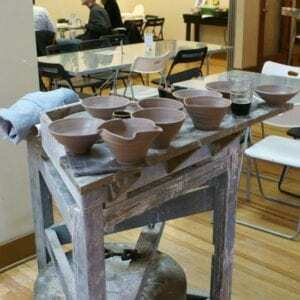 David McBeth, the potter creating the bowls for the project, will be at the cafe creating more. The Empty Bowls Finale Party is December 20th at the Liermann Loft above Urban Eats, in conjunction with the DT2 Holiday Party. Come by for food, drinks, live music, and pictures with Santa. While the party is free to attend, a donation of $15 or more is suggested, and in return you will receive a bowl and a voucher for soup from Urban Eats. Reservations are required and can be made through Eventbrite. This post was updated on January 6, 2018 .